Following the last revision, the main feedback we received was about the missing list of dependencies. Some community members seemed to be looking at this list for information purposes (not necessarily using the website to generate a new app), while others would just like to see what’s available. While start.spring.io seems like a very simple service, generating applications with a simple HTML form, there’s much more to it - this round of feedback taught us that we need to double-down on product discovery and user centered design. We brought the dependency list back to the page but in a way that will help us to better understand how the website is being used and how to improve it. We hope that the community will find in that list what was missing in the previous version. 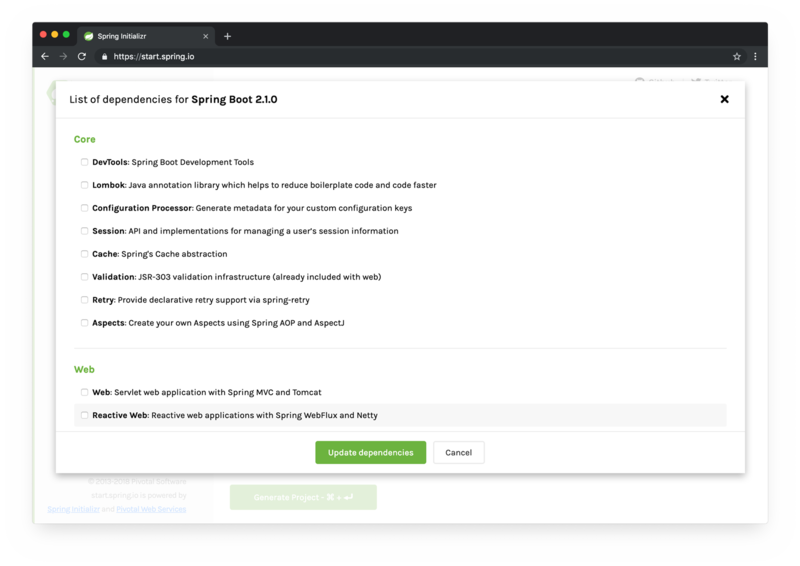 Of course, we fixed a few HTML/CSS issues and improved version incompatibility messages to help you select the appropriate Spring Boot version. Because the Web UI changes will be more and more involved, we’ve decided to move all Web UI-specific code to the start.spring.io project. This will hopefully clarify things. If you’re interested in running a service very similar to start.spring.io, you should now fork the start.spring.io project. If you’d like to write your own Web UI or work on core changes, then using the Initializr library is a good starting point. Over the next couple of weeks we will be conducting user interviews to gain better insights on how to improve the website experience and a deeper understanding of the “whys” behind how users are interacting with the service. As we cannot interview all of our users (we appreciate you all! ), we invite you to leave your input and thoughts with our optional anonymous survey. This will allow us to build a larger picture of how people are using the service and the expectations and wants from the community. Thank you for your feedback and support as we continue on this journey.